Bank Pembangunan Malaysia Berhad (BPMB), wholly-owned by the Malaysian Government through Ministry of Finance Inc., is committed to nurture Malaysia's young talents who will contribute to the nation's development agenda, through our Undergraduate Scholarship Award 2016 / 2017. The scholarship award is open to Malaysia's outstanding students to pursue finance-related undergraduate degree at leading overseas universities. Biasiswa Bank Pembangunan Malaysia Berhad 2016 / 2017. * Age at least 17 years old and not more than 23 years old. * Obtained minimum 7A5 in Sijil Pelajaran Malaysia or equivalent. Pre-University / Foundation / Matriculation / Diploma studies. * Has secured a placement at selected leading overseas university in the preferred discipline . * Actively involved in extra-curricular activities and sports. 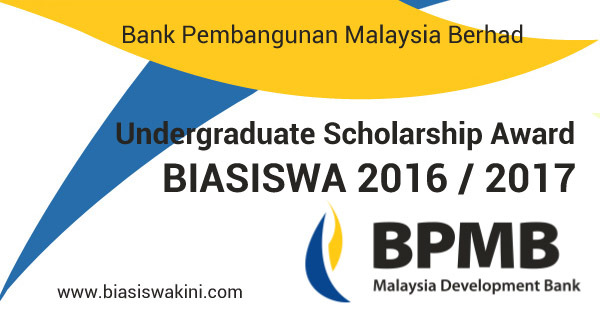 0 Komentar untuk "Biasiswa Bank Pembangunan Malaysia Berhad / BPMB Scholarships 2016 / 2017"